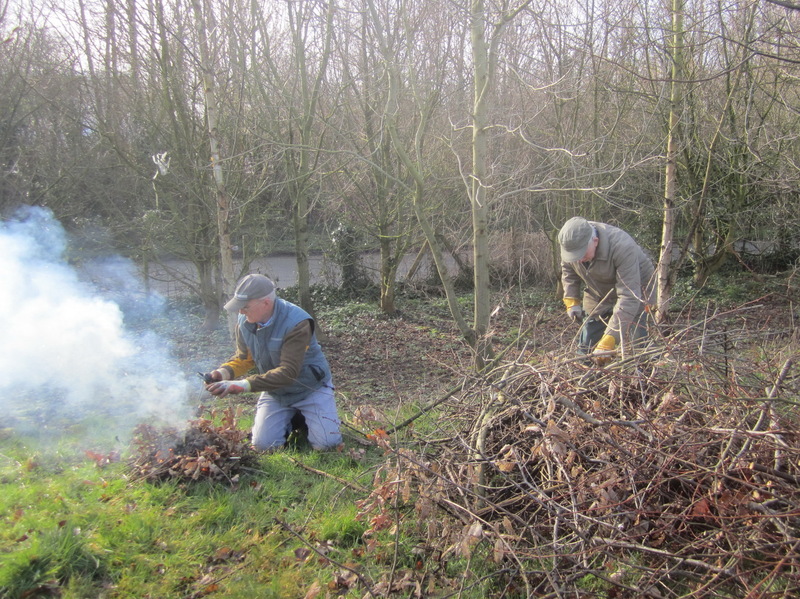 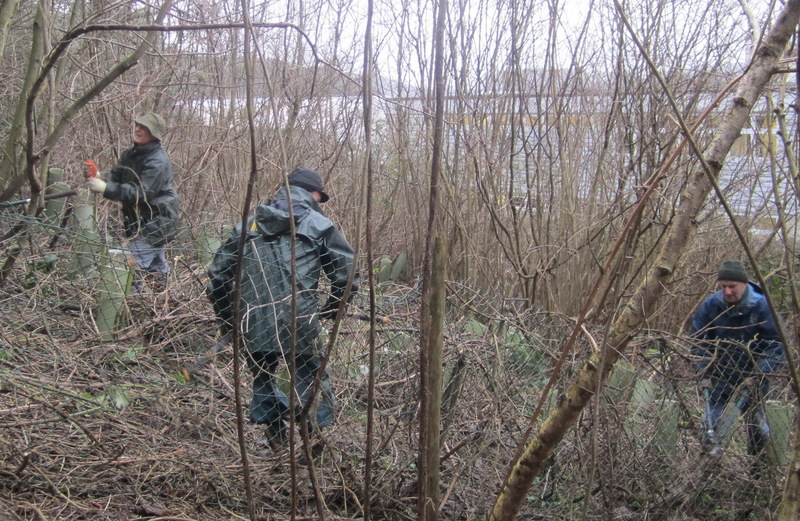 Cutting scrub at the overgrown western end of Marine Lake and stacking it ready for the chipper. 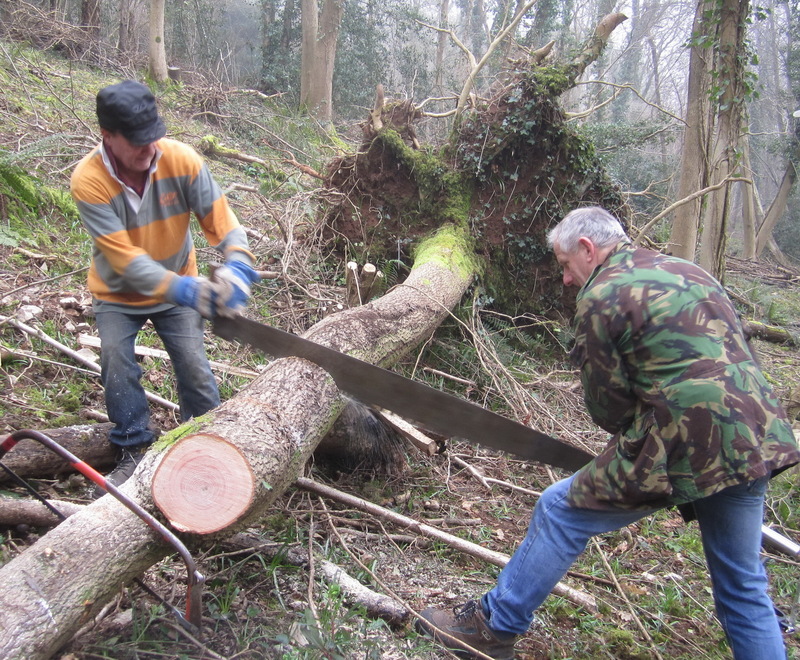 This Woodcutters’ contribution is part of a major lake refurbishment project. 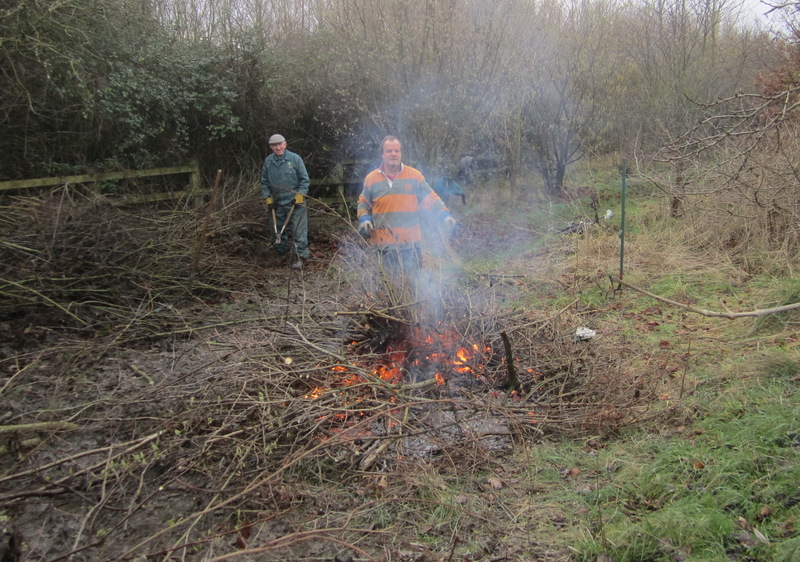 Coppicing hazel in Quinney’s Wood. 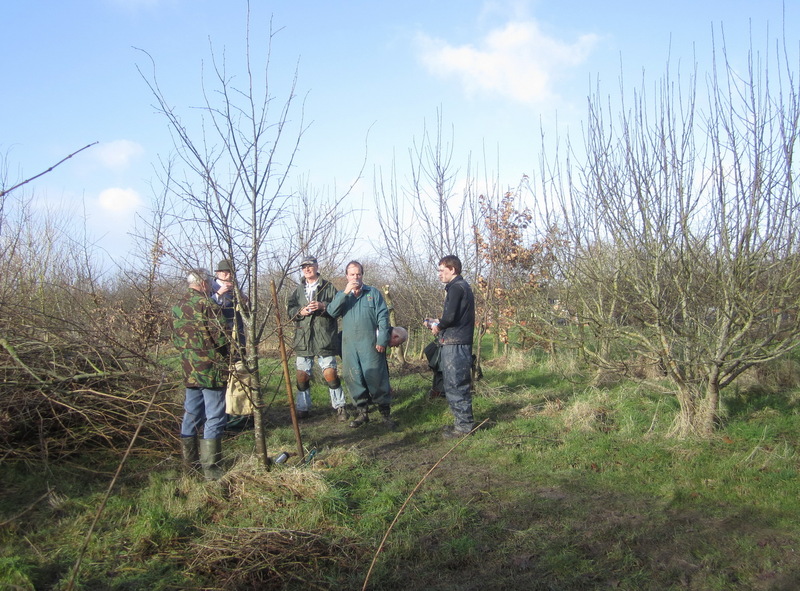 During the same session young oak trees were crown raised by removing lower branches and hedge trees were selectively trimmed. 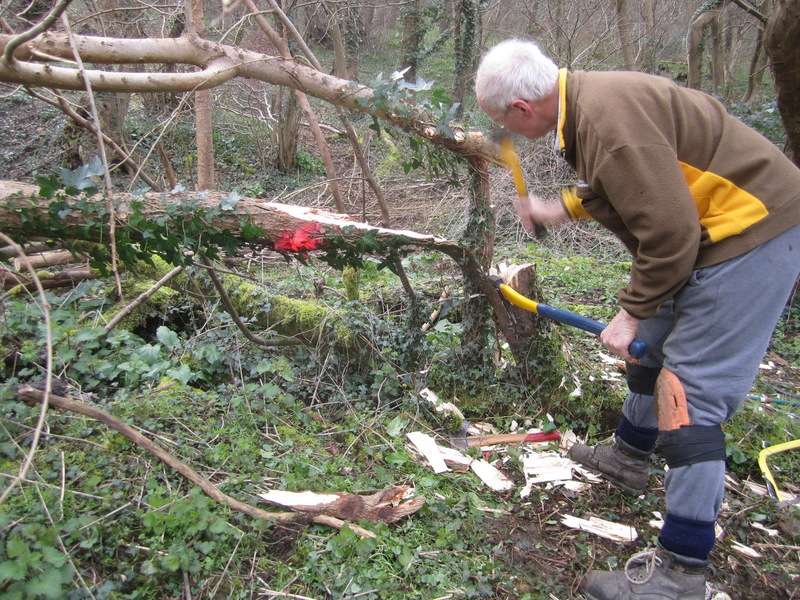 Poets’ Walk – Coppicing sycamore with a cross cut saw. 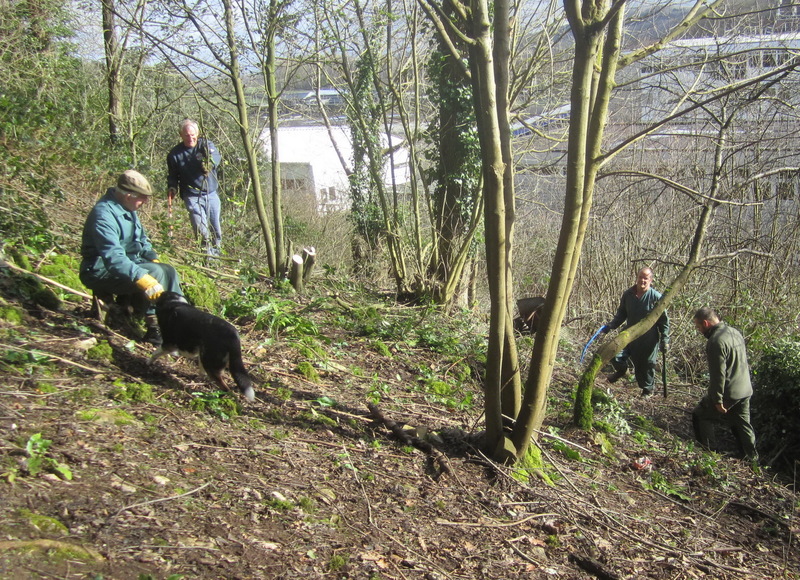 A thicket habitat for wildlife as well as views to St Andrew’s Church, Wain’s Hill and the Welsh coast are being restored. 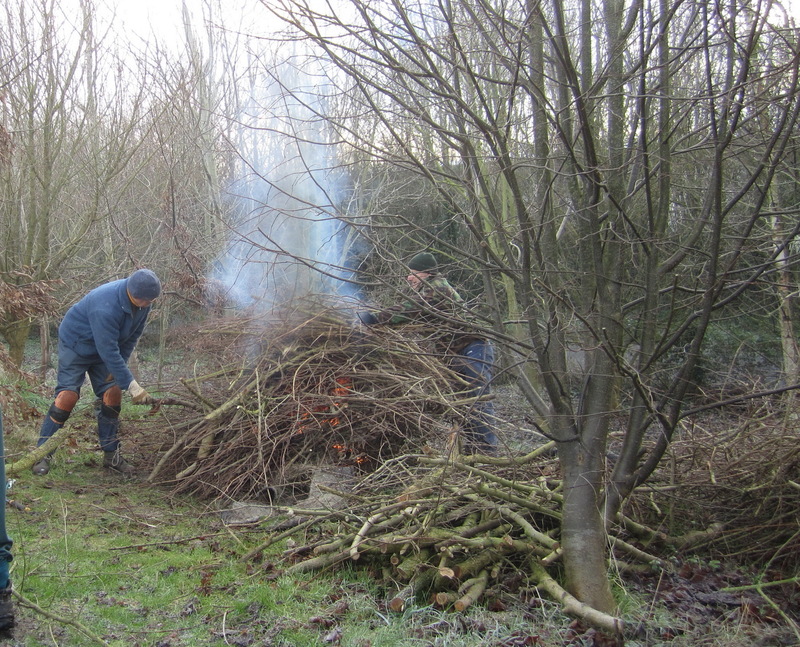 The two largest sycamores are retained to be coppiced next year. 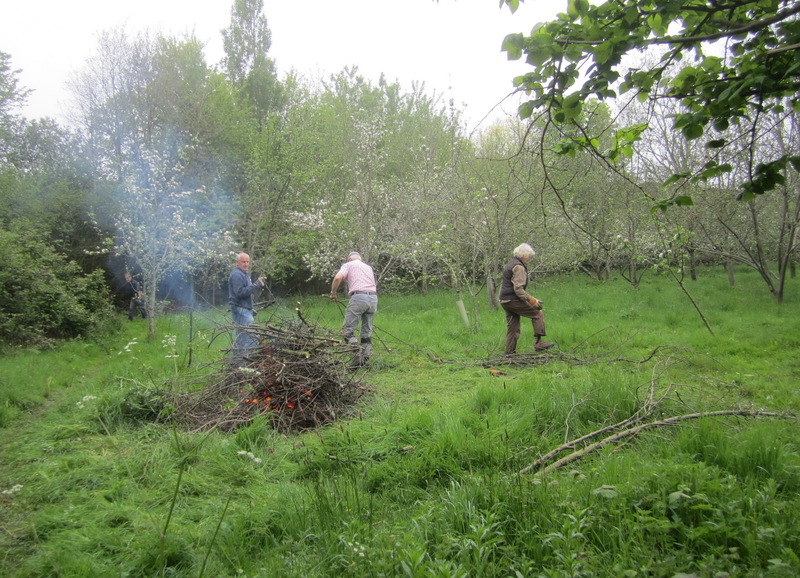 Poets’ Walk – coppicing sycamore on Church Hill to create a thicket habitat for wildlife. 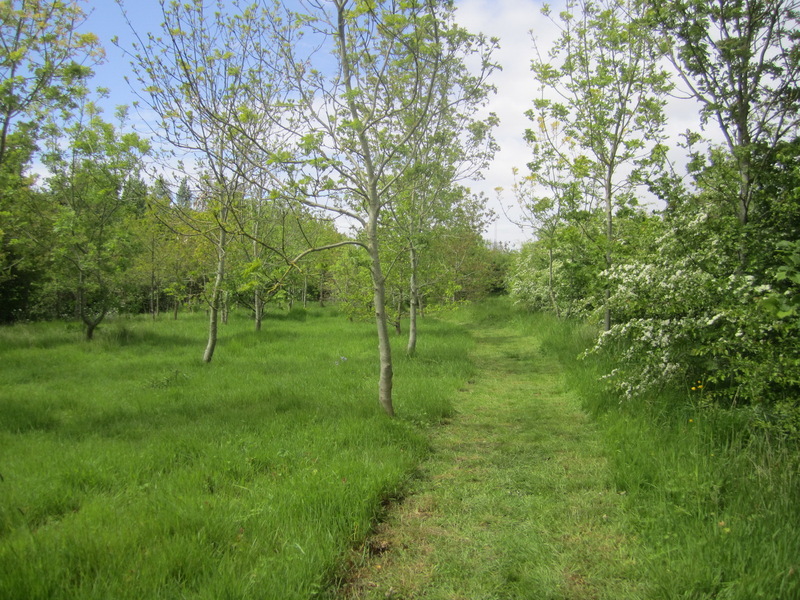 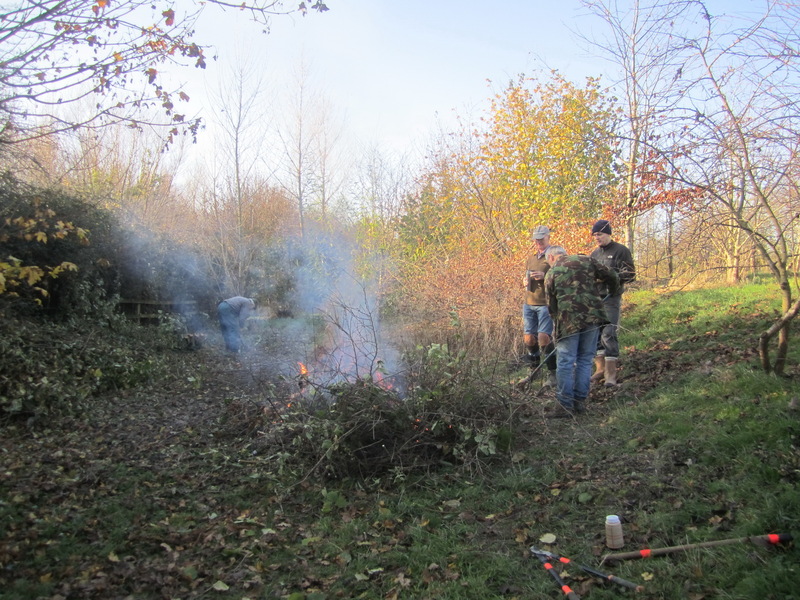 A strip of young bramble shoots was first brushcut to restore grassland bordering the site. 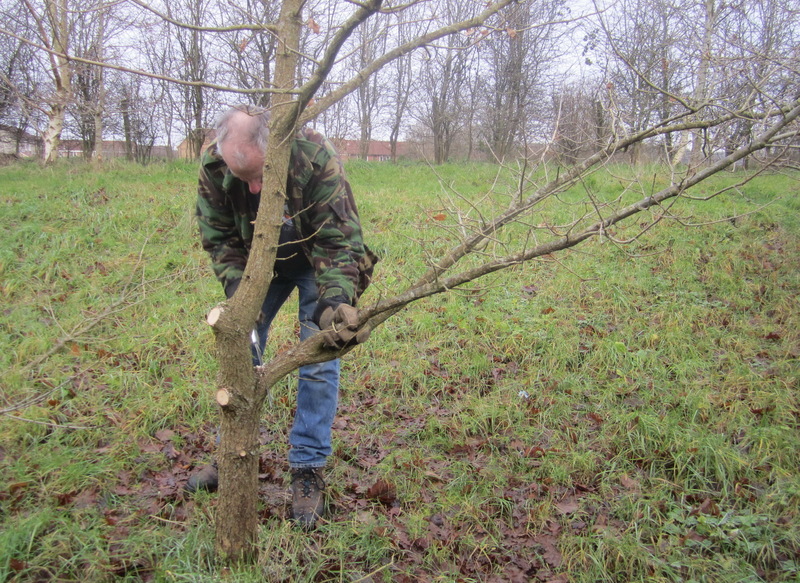 Planting an Elm sapling (raised from a mother tree apparently resistant to Dutch Elm disease) on Poets’ Walk as part of the Great British Elm Experiment. 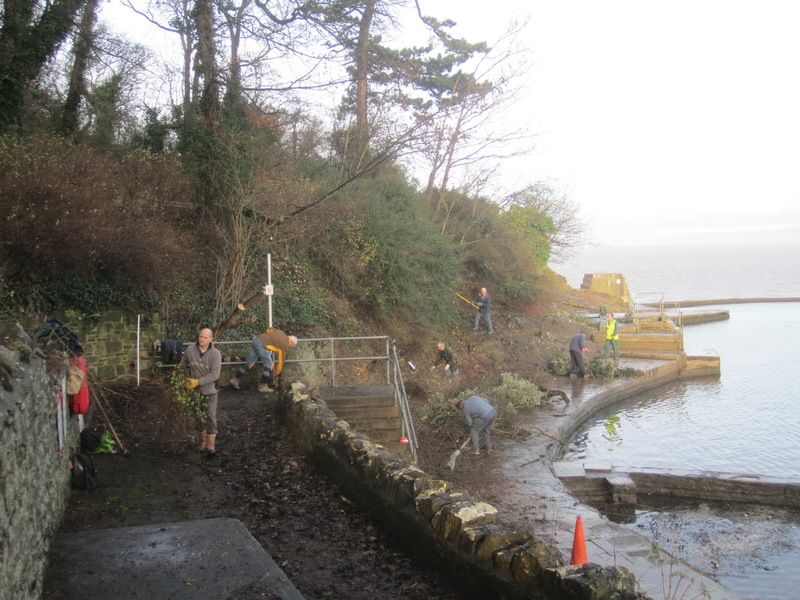 Read more in the Clevedon Civic Society’s autumn 2014 edition of the Clevedonian. 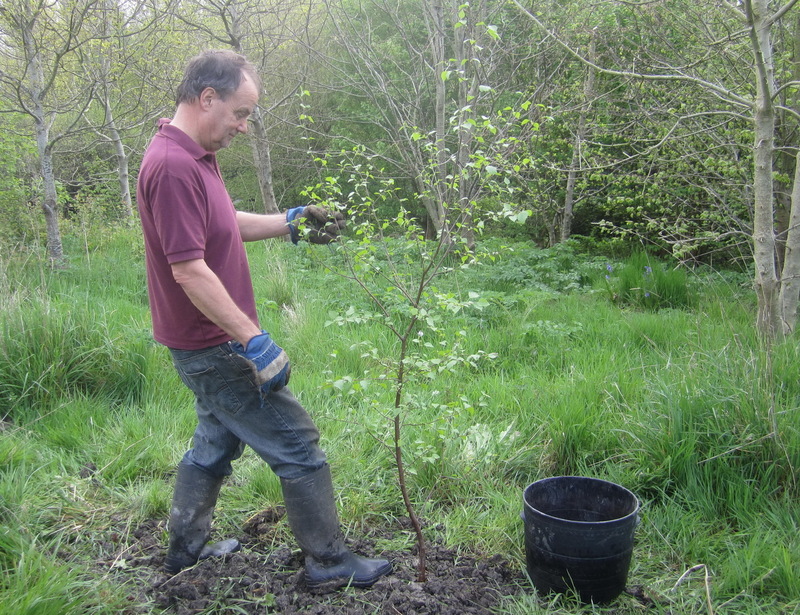 Veteran Woodcutter Cliff Beames planting “Beames’ Elm” in Quinney’s Wood. 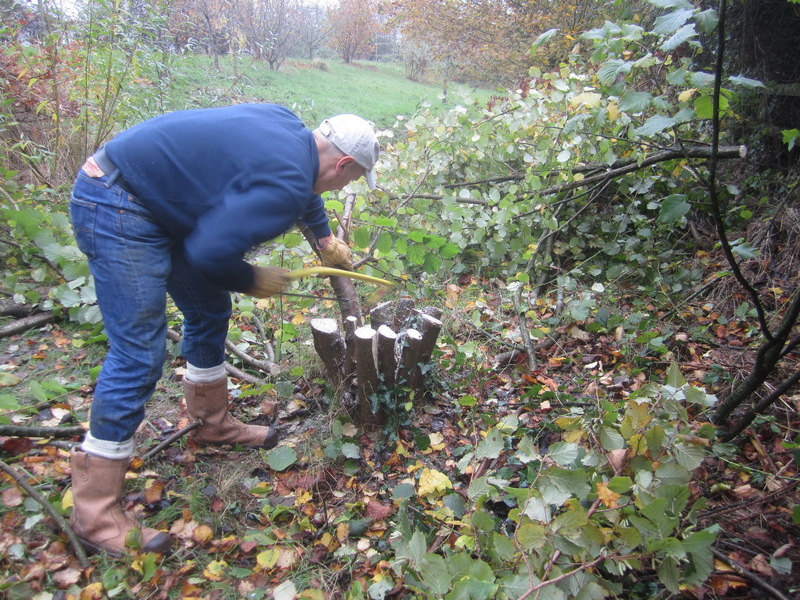 This elm was specially raised from a mother tree apparently resistant to Dutch Elm Disease. 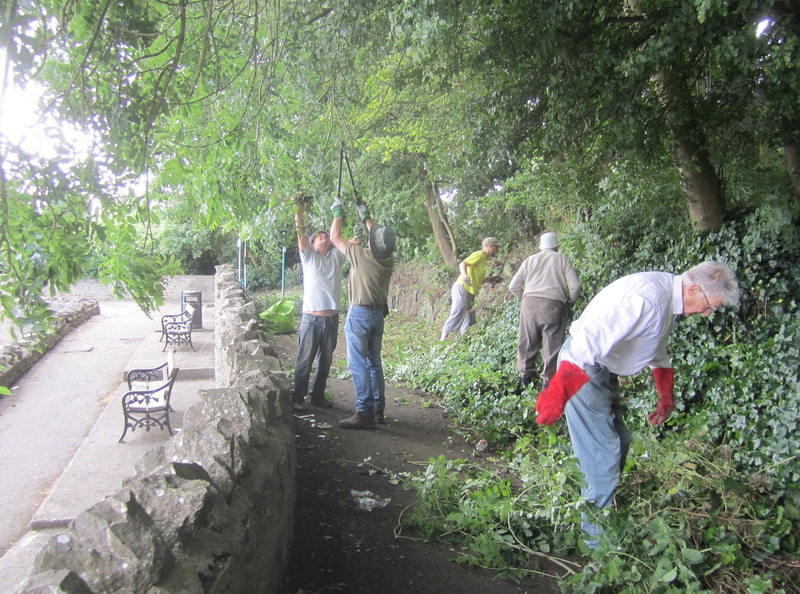 Read more in the Clevedon Civic Society’s autumn 2014 edition of the Clevedonian. 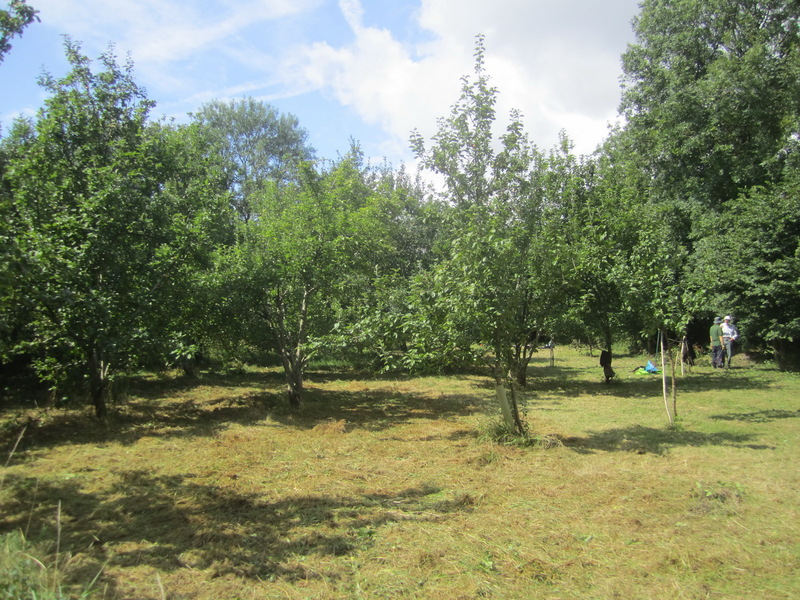 Most of the Community Orchard floor has now been brush-cut, and brambles and other scrub around the edge have been cut back. 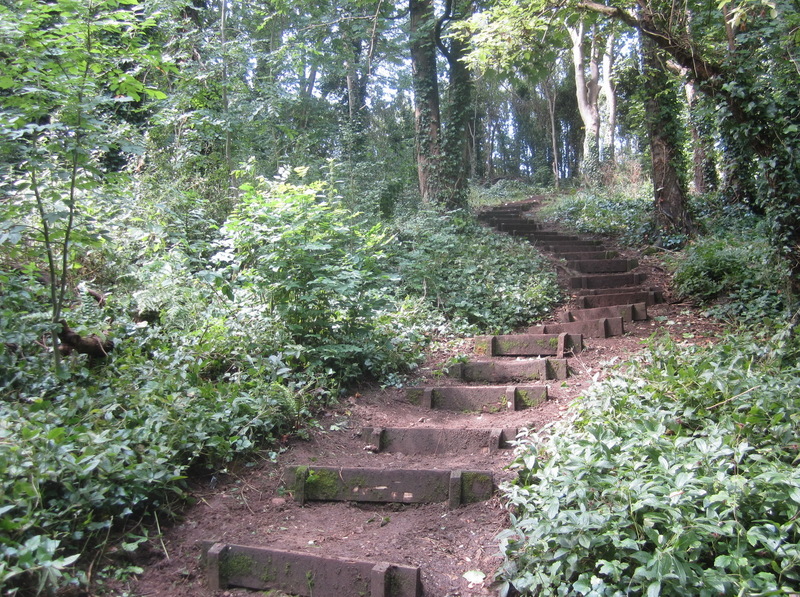 Salthouse Wood – woodland steps and the immediate area weeded, and 4 steps replaced Wild damson suckers and sycamore shoots from stumps cut out. 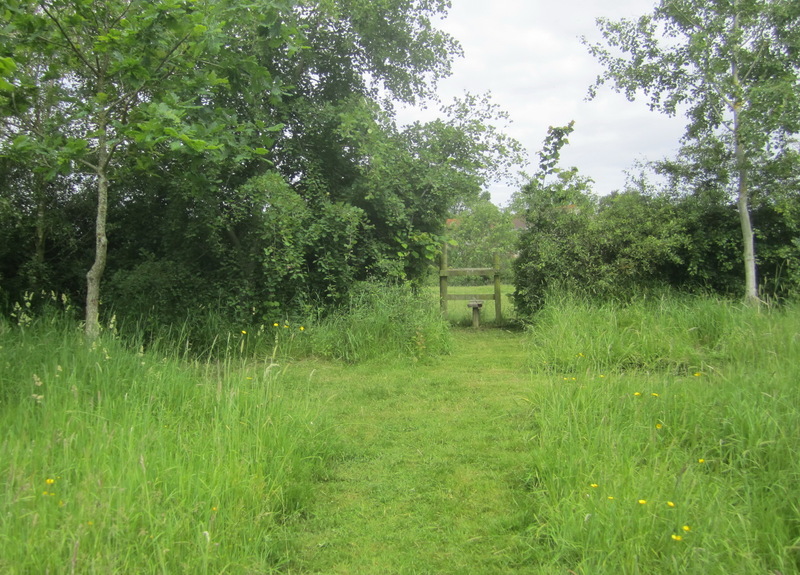 The paths in Quinney’s Wood are mown and branches trimmed back to give better access. 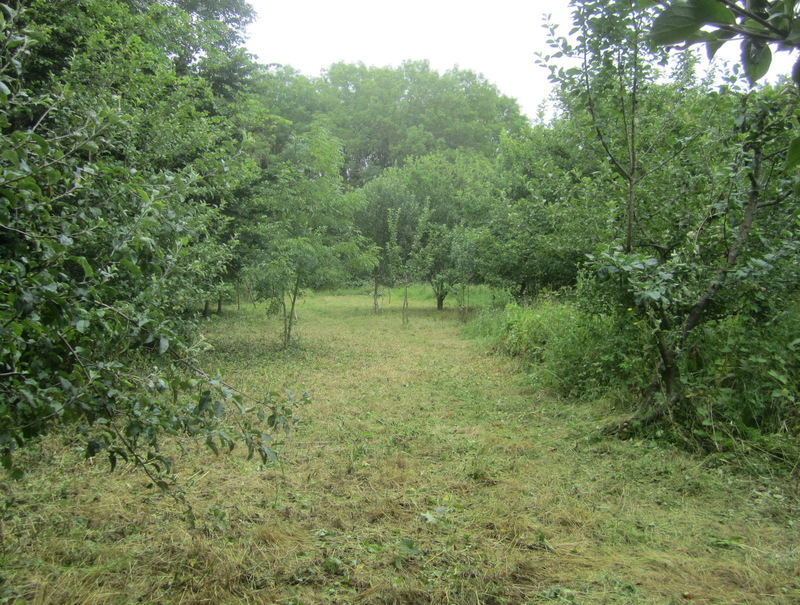 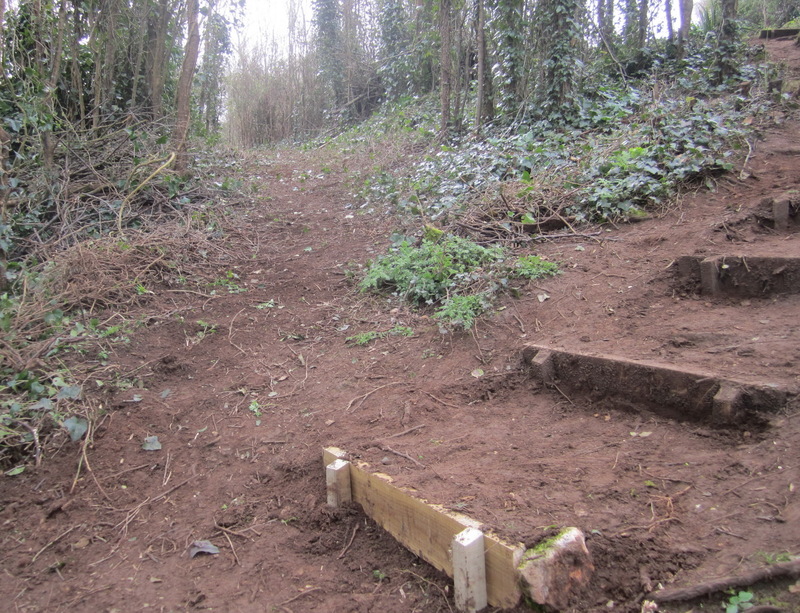 A badly overgrown section of the Millennium Community Orchard brush-cut and scythed for Transition Clevedon. 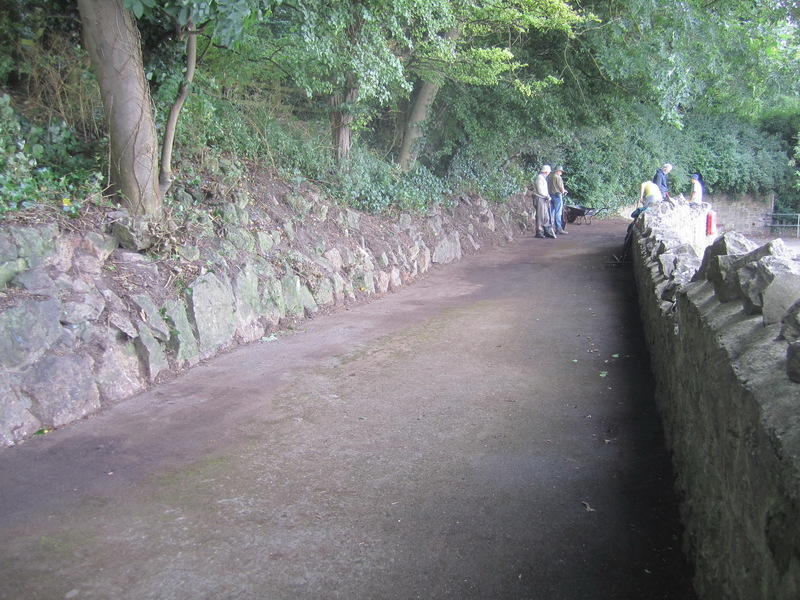 Paths are now clear. 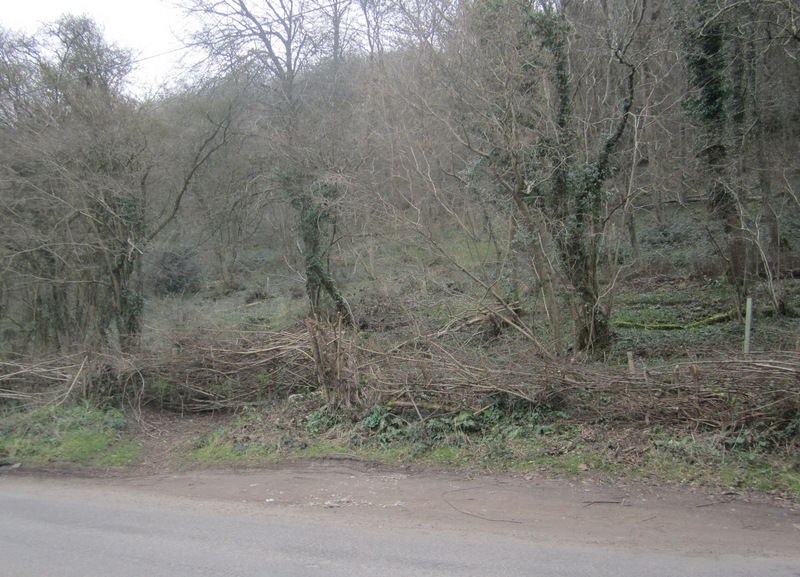 Tree stakes on young trees have been reset. 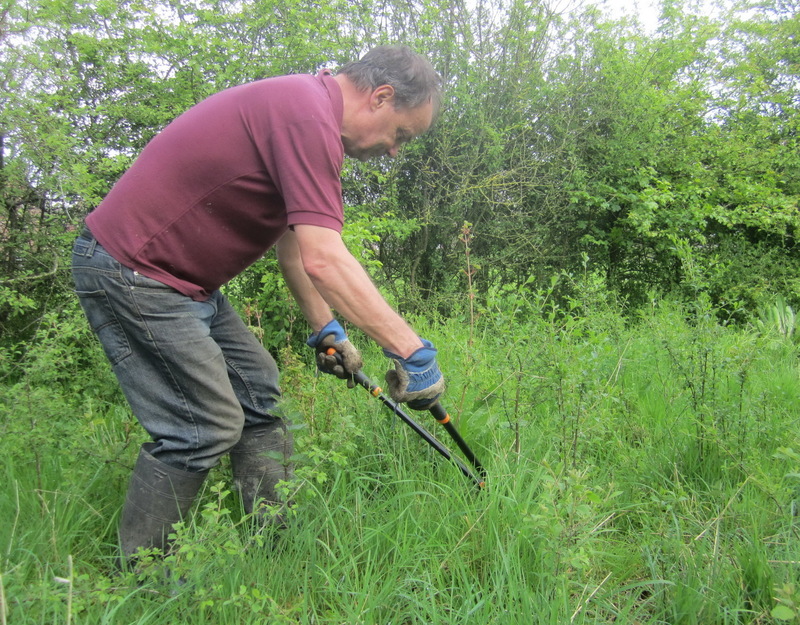 The main paths in Quinney’s Wood are kept mown with mechanical trimmers. 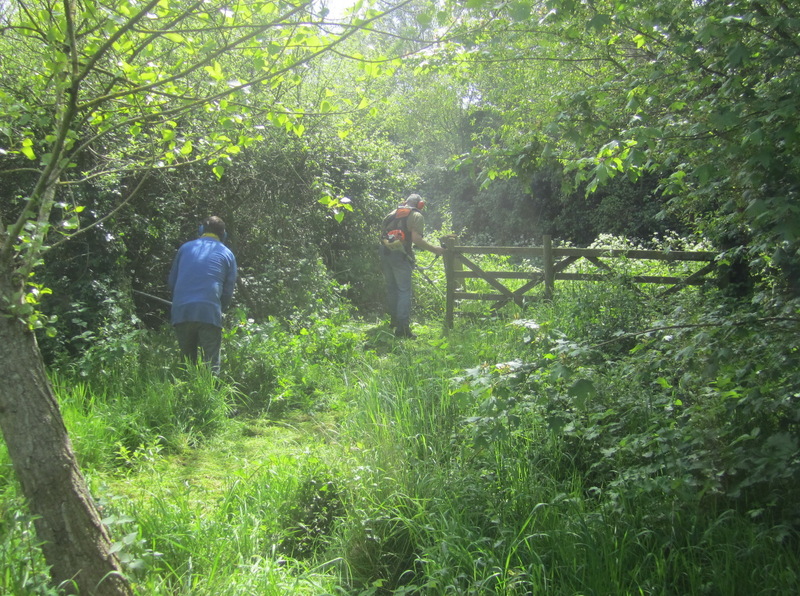 The Woodcutters are pleased to be able to help the Marine Lake Enthusiasts Society (MARLENS) by clearing an area beside the Salthouse Pub for a new tool shed. 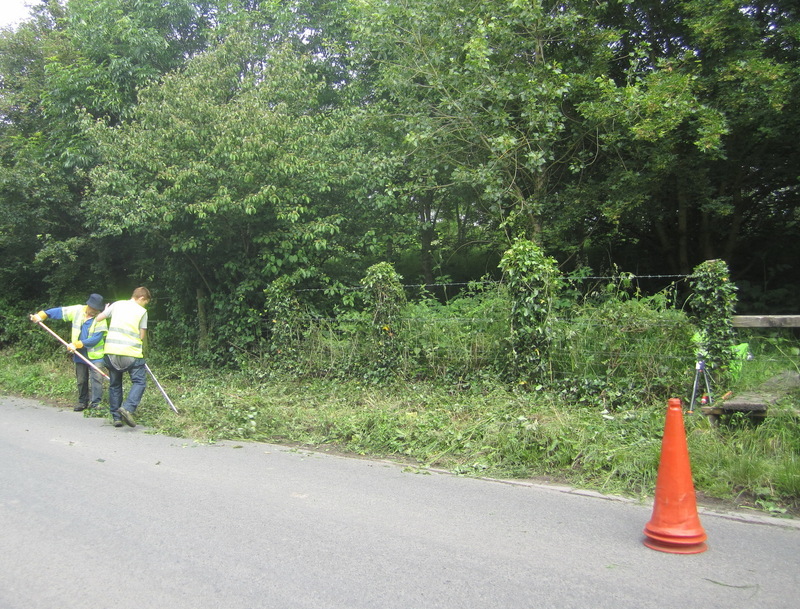 The main paths at Quinney’s Wood are mechanically mown, and arisings raked off. 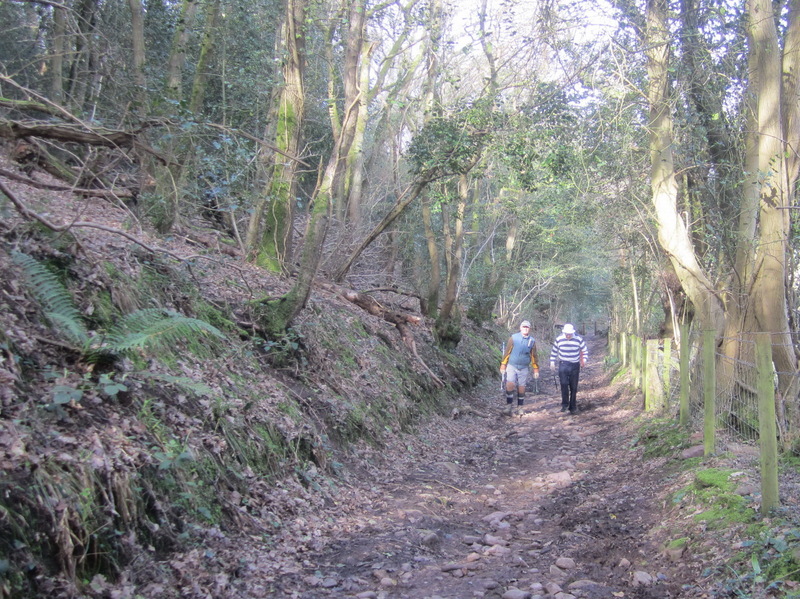 Norton’s Wood bridle path is cleared annually of overhanging branches and other obstacles. 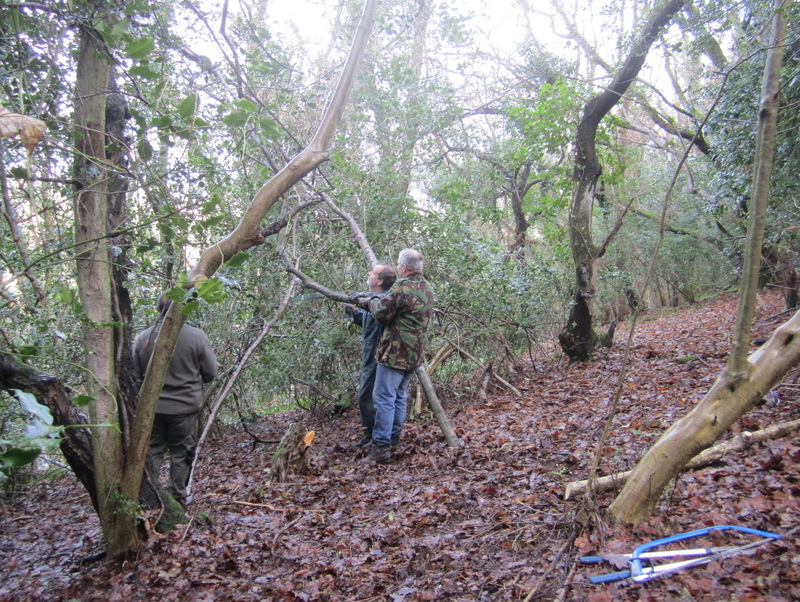 Sycamore and Holm oak bordering the path are removed. 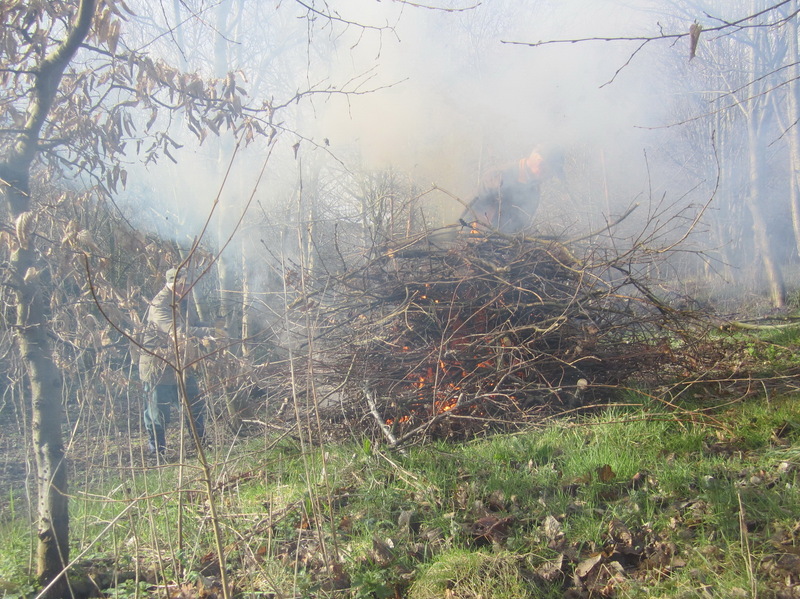 Norton’s Wood – coppicing hazel.